Mark Perry and I both photographed at Diamond one day last week, so with his permission I thought I'd share our stories together. His text is in italics and the post title came from Mark. 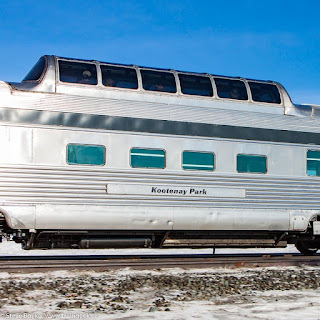 Mark: Wow, whoever says Winnipeg is boring for railways is crazy! I had in mind a shot of the tail end of VIA 1 leaving the city this afternoon so I headed west. 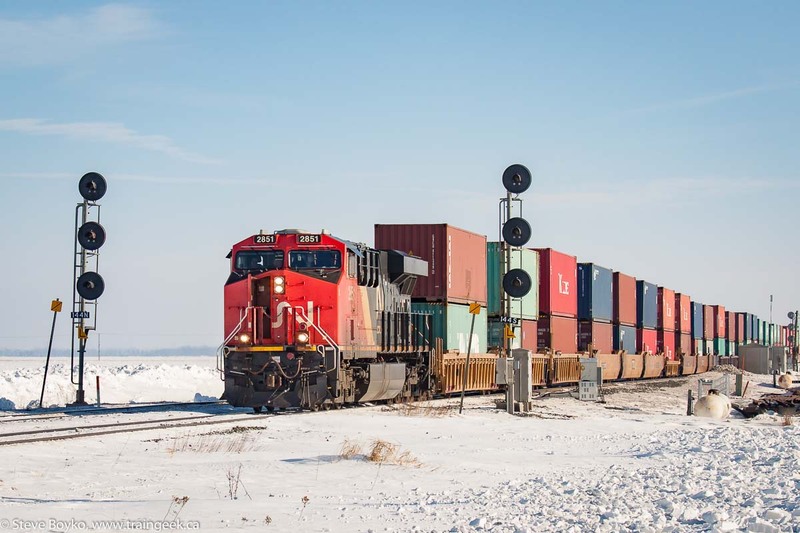 Stopped in at St. James Jct for a quick look, BNSF sitting there waiting to get into Fort Rouge, a southbound CP Altona WF coming, CN 101 heading west, what to do? I had a brief look but did not do any shooting. Instead I jump back in the truck and head west following Q101. Guy is going like hell, his head end beats me to Diamond (sadly no Mayor around today). Steve: I was itching to get out and shoot some trains. 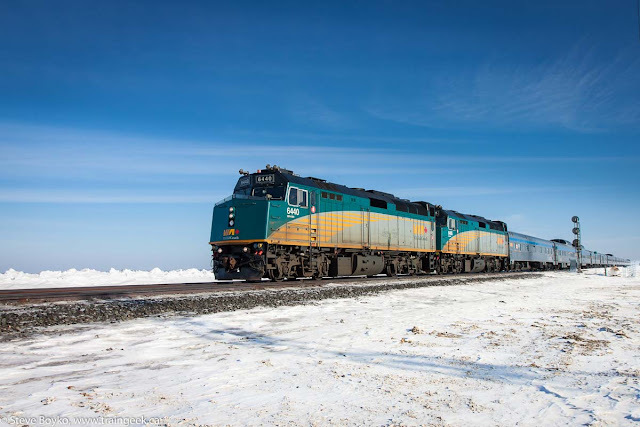 I checked the VIA Rail tracker and saw that VIA 1 was on time, so I hopped in my car and headed to Diamond outside Winnipeg. As I approached Wilkes Avenue from the south, I saw a westbound CN intermodal train also heading toward Diamond. I was able to get in front of it pretty easily and decided to catch it "splitting the signals" just west of Diamond. That was CN 101 in its typical 1+1+1 configuration with CN 2851 / 3018 / 3118. CN 101 with the air conditioning on, splitting the east-facing signals at Diamond. There is a railfan standing on the CP crossing in a silver car shooting, he wants to shoot the tailend DP unit going over the diamond. Hell I'm going to ruin his shot, so I slam on the brakes so I don't wreck his shot! As I positioned myself to shoot the trailing unit crossing the diamond, I saw a truck driving up and it sure looked like I was going to get skunked. Thankfully it was Mark Perry and he paused long enough for me to snap the crossing. 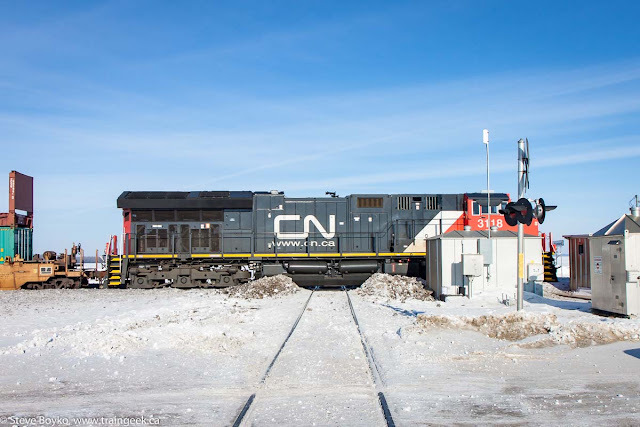 My photo of CN 3118 trailing on train 101 at Diamond. The shadow of Mark's truck is visible at far right! Soon the steel diamond stops hammering with 700 wheels and I see it's Steve Boyko! First words out of his mouth are "I hear a horn, I think the CP is coming!" Sure enough here comes a GP38-2 and a GP20ECO and a string of empty hoppers headed south to Elm Creek. I agree that the first words I said to Mark probably were about the CP horn I heard as CN 101 was passing. Sure enough, there were headlights on the CP Glenboro sub but the train stopped a long way away. Well what to do? Head west for my tail end shot of #1 or shoot the CP coming across the diamond? Well maybe the CP is going across first so I can bag him and then head west. 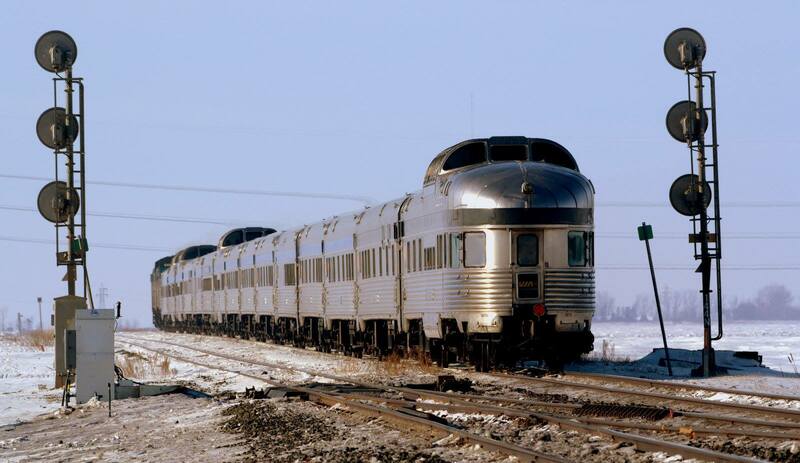 No sooner did I think that, here comes #1's headlight on the north track, okay we stay put at the Diamond. The next train up was VIA 1 and I shot the "Canadian" splitting the east facing signals. 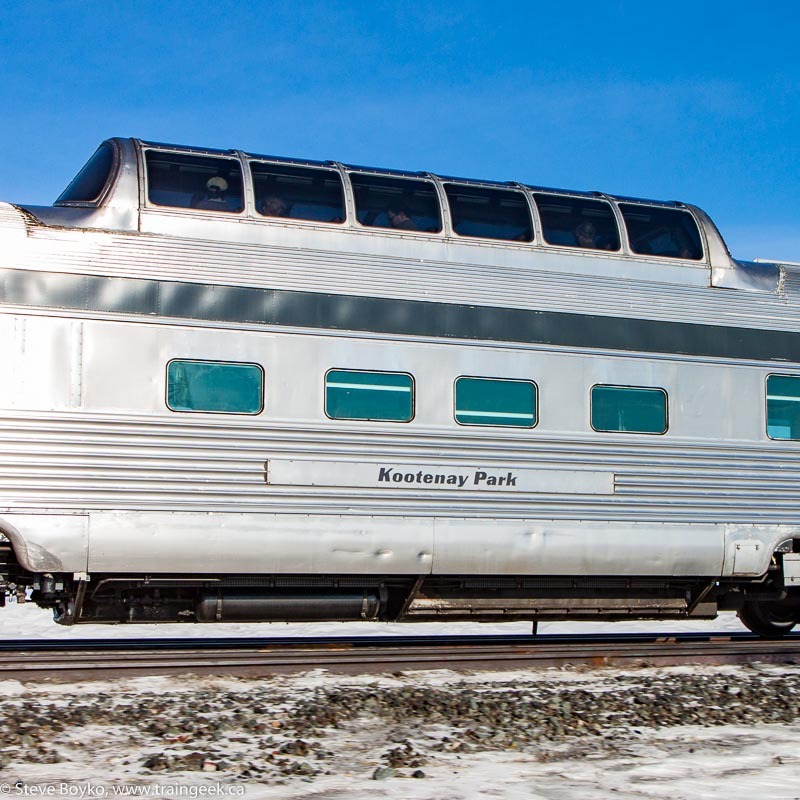 The train had four deadhead cars on the head end with Kootenay Park on the rear. Steve shoots the head end as I shoot the tail end. 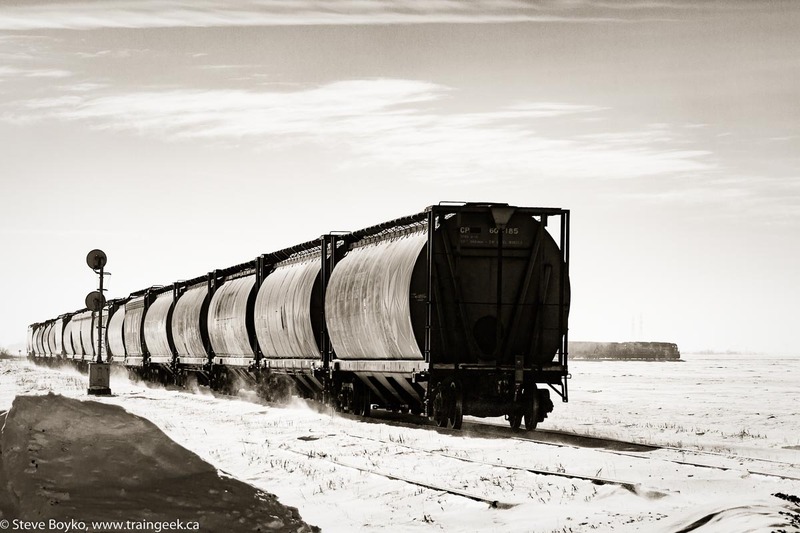 VIA 1 heading west out of Winnipeg. Mark Perry photo. 5 minutes later the CP pounds the diamond and heads south. 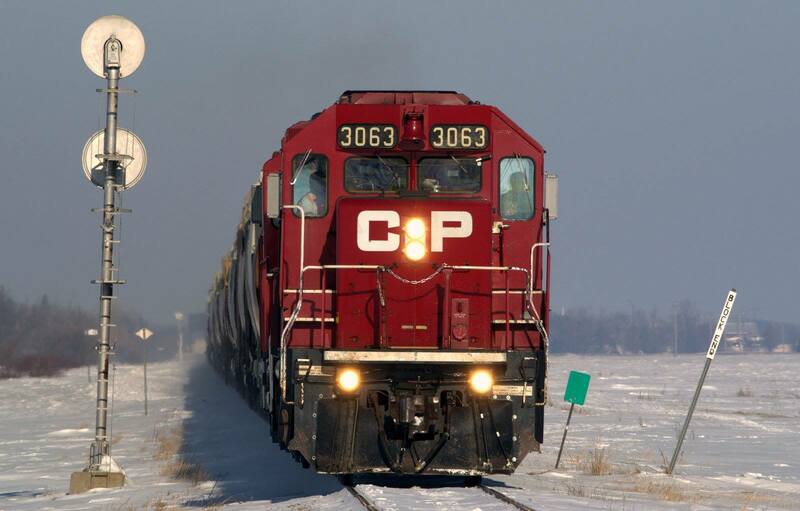 CP 3063 has the green light to cross the diamond. Mark Perry photo. 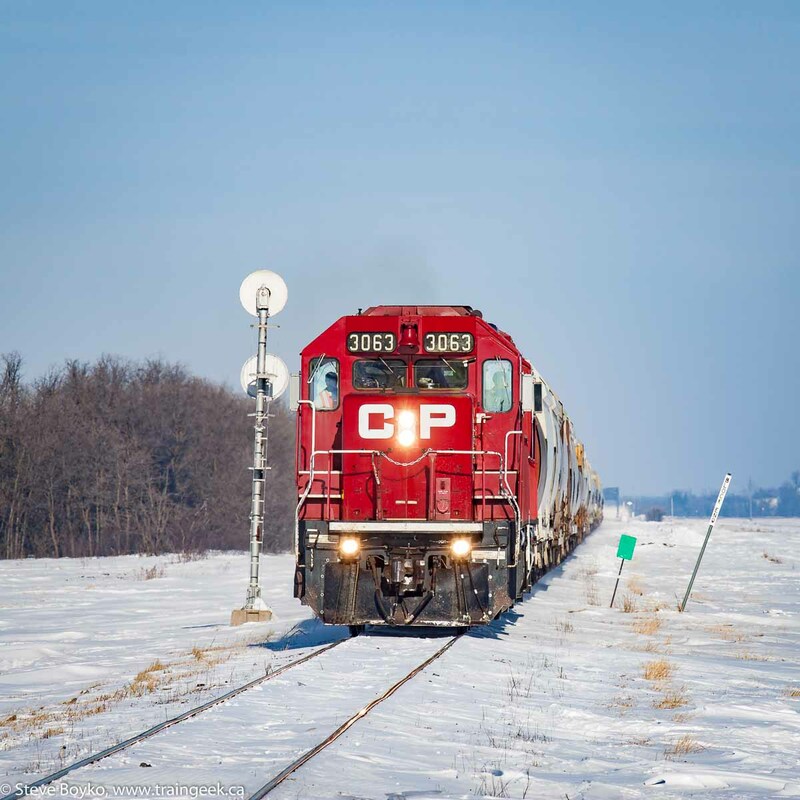 Next was CP, with a Geep and an Eco unit (3063 / 2220) pulling some grain mtys for elevators along the line. I took a few shots as they rolled on past, then Mark and I said our goodbyes and went our separate ways. Good times. I don't know much about trains but those 2 photos of the VIA 1 are cool! Nice to run into someone you know there too! Thanks, Jenn! 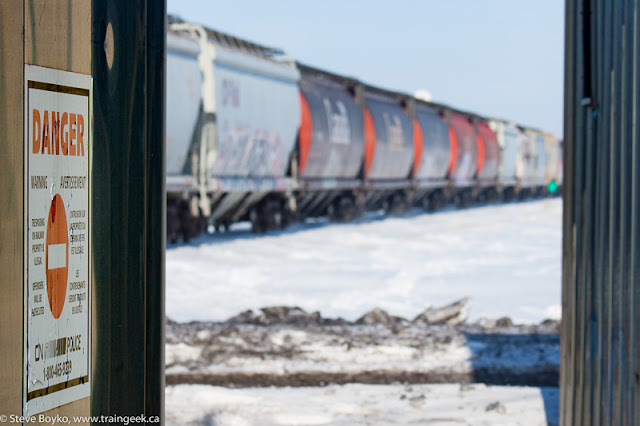 It is always nice to run into someone else.. railfanning is often a solitary pursuit, but company is always welcome. Great coverage guys. You do Winnipeg well.